This is a collapse of vertebral bone. It can affect one or more vertebrae. Compression fractures typically develop in your mid or lower back. This can change the shape of your spine. Most compression fractures develop because of osteoporosis. This is a loss of bone density. 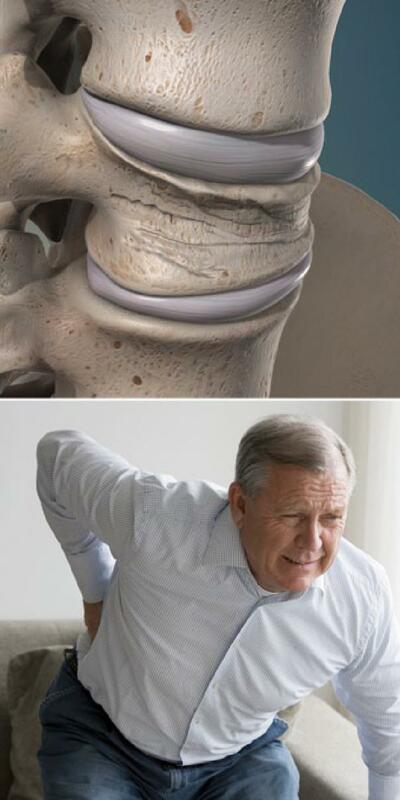 It causes your bones to become weak and brittle. If you have osteoporosis, routine daily activities such as bending down or coughing can gradually damage your vertebrae. Compression fractures are also caused by traumatic injury. And they can be caused by cancer of the spine. Compression fractures can be painful. The pain from sudden fractures can be severe and debilitating. Fractures that develop gradually may only cause mild pain. Compression fractures can change your height. You can lose several inches of height over time. These fractures can also cause your spine to bend forward. You may develop a stooped posture and a rounded back. Compression fractures can put pressure on the spinal nerves that travel to the legs. This makes walking difficult. The pressure can also interfere with the function of the bowels and bladder. Treatment options may include rest and medications to control your pain. You may benefit from a back support and from physical therapy. If these methods are not helpful, you may benefit from a procedure such as vertebroplasty or kyphoplasty. These can help stabilize your spine. Your healthcare provider can develop a care plan that is right for your needs.